Why you need this report: Determine which attributes are key drivers of customer sentiment by looking at the correlation among a variety of attributes in relation to the “Recommend” question (by default), or a question specified by the user. The Correlation report provides a method of identifying attributes that are key drivers of sentiment. This report can provide insights into what is working and which areas your company may need to realign resources and strategy. Click and hold down the Shift key. While holding the Shift key, via the trackpad or mouse, left click and select the rectangular area you wish to zoom in on. To see a different part of the chart during the same zoom instance, via trackpad or mouse, left click and hold to move the chart in any direction. Quadrant I (upper left-hand)- Fix These: Attributes that fall into this quadrant are highly correlated with a specified range of scores for a given attribute used for comparison. These are the low-hanging fruit to focus on, as scores trend lower, but addressing these areas can increase client satisfaction (if the comparison attribute is the “Recommend” question). 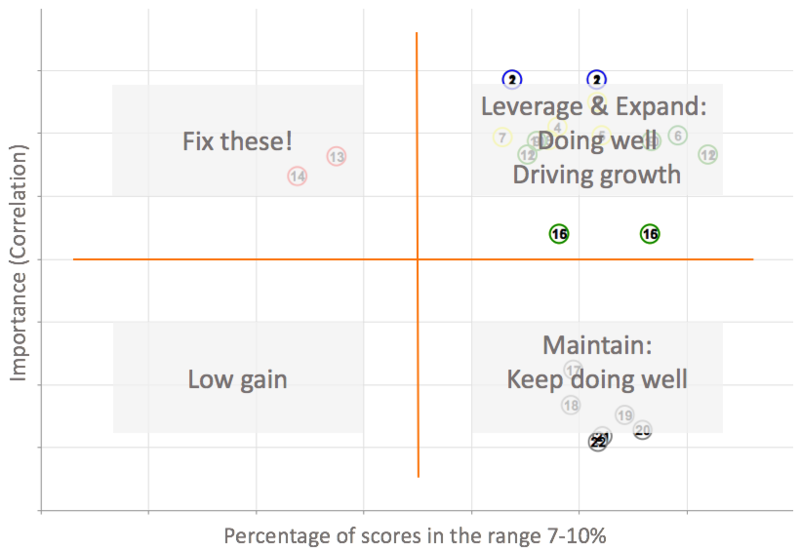 Quadrant II (upper right-hand)- Leverage & Expand: Attributes that fall into this quadrant are highly correlated with a specified range of scores for a given attribute used for comparison. These are areas that your company is doing well in, exhibiting a connection with client satisfaction and scores trending higher. Customers are willing to voice what they value. Quadrant III (lower right-hand)- Maintain: Attributes that fall into this quadrant are NOT highly correlated with a specified range of scores for a given attribute used for comparison. However, it appears that account contacts exhibit scores trending higher. These attributes are valued by customers and are not correlated with the main attribute, but contacts pay enough attention to them in order to provide consistent feedback. Quadrant IV (lower left-hand)- Low Gain: Attributes that fall into this quadrant are NOT highly correlated with a specified range of scores for a given attribute used for comparison. Contacts exhibit scores trending lower, and this may signal a chance to focus on these attributes through further engagement, but with low gain. It may not be worth directing resourcing towards this area quite yet. Lower scores and lack of correlation may mean that your company is performing well elsewhere, but customers are not enthused with this Quadrant IV attributes. Categorization of results by color: Hovering over each attribute on the chart will display more details within a colored box.